We love Scotland. And since it's just a few hours away from us, we love going on road trips there. 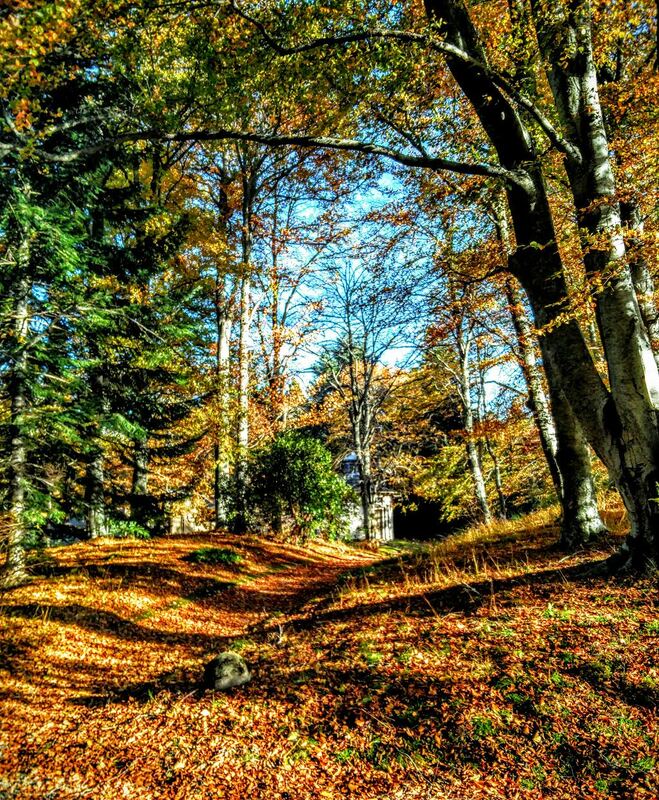 This time we decided to check out the Scottish Highlands during the fall season. We did a seven day road trip of the Scottish Highlands and a bit of the Isle of Skye and threw in a few castles as well. We were extremely lucky weatherise, we had sunshine or partial sun almost on all days of the trip and of course the Highlands sparkled in the autumn sunshine and the weather was also mild. Benevolent Scottish weather Gods we thank you! This trip was extra special because my brother, sister-in-law and eight month old baby niece were with us. It was my niece's first road trip and we were all excited. So we were a full car and a baby to boot! We were a little worried if the baby could do the trip, but timely breaks and letting her out of the car seat helped. She was a model traveller and her car seat was so snuggly that once the car started she would doze off within a few minutes. Day 1, Friday~ We started from Sutton, which is a London suburb, around 8 p.m. in the evening and reached Preston around 1.30 a.m. in the morning. We chose Preston because it was the exact midpoint between Sutton and Glasgow. It was a five and an half hour drive, late evening on a rainy Friday, the motors roads had quietened down considerably (people were home having dinner with their families or out partying with friends, my asumption) and we hardly got any traffic at all. My husband, who was driving, came back home from work and had about a two hour nap, so driving till late night wasn't very tiring for him. Rather he enjoyed driving in the near empty roads. We chose a hotel right on the highway so that next morning we didn't waste anytime with detours etc. Day 2, Saturday~ The morning dawned cold and grey. We could have done with a few more hours in bed, but it was the day we were entering Scotland, so excitement was high and inspite of our late bedtime we were all up by 7 a.m. We started around 9 a.m. in the morning from Preston and arrived at Stirling Castle around 3 p.m. in the afternoon. Somewhere along the drive the clouds lifted and the sun came out. So it was a really scenic drive. We got some traffic here and there, but on the whole it wasn't too bad. We were able to catch the last tour of the castle. I am a big history buff and love visiting castles and forts. I could go on and on about this castle, but that's another story for another blog post. After exploring the castle, we set off for Kinlochard which is a tiny village at the western edge of Loch Ard. The drive was beautiful and the Loch Ard looked serene in the late afternoon sunshine.We reached our hotel which was beautiful by the way while there was still sunlight. But by then we were all feeling lazy to go out to explore, instead we opted for an early, relaxed dinner. Day 3, Sunday ~ Early morning after breakfast we explored the village and the loch a little before hitting the road. 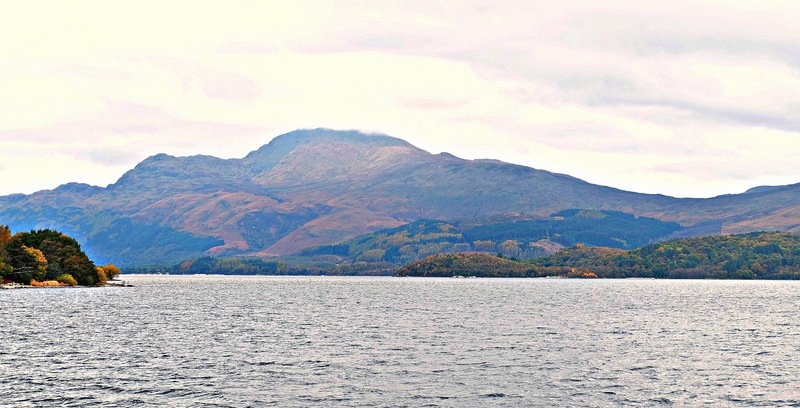 This time the destination was Luss by Loch Lomond. This lake is the largest in all of Scotland and accompanied us on the journey for quite a while. 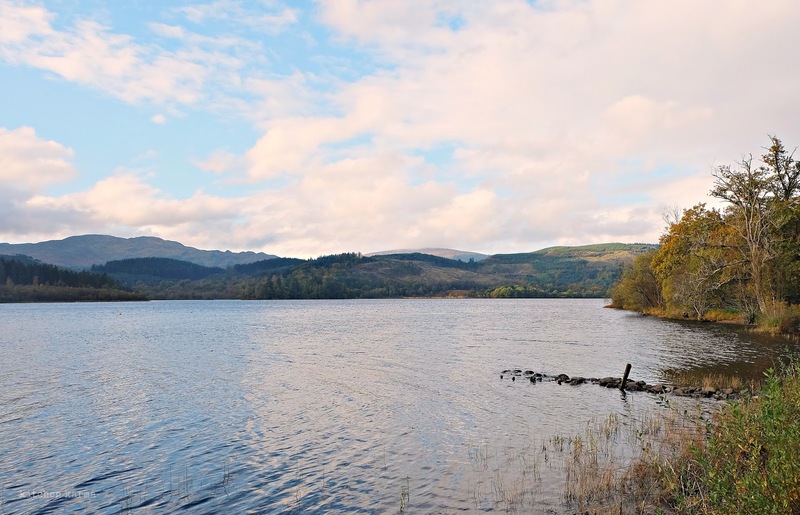 It was another sunny day, and the Loch Lomond was sparkling in the autumn sunshine. Finally we arrived in Luss and headed for the lake. It was cold to sit on one of the benches on the lake shore, but if you walked around it was not too bad. 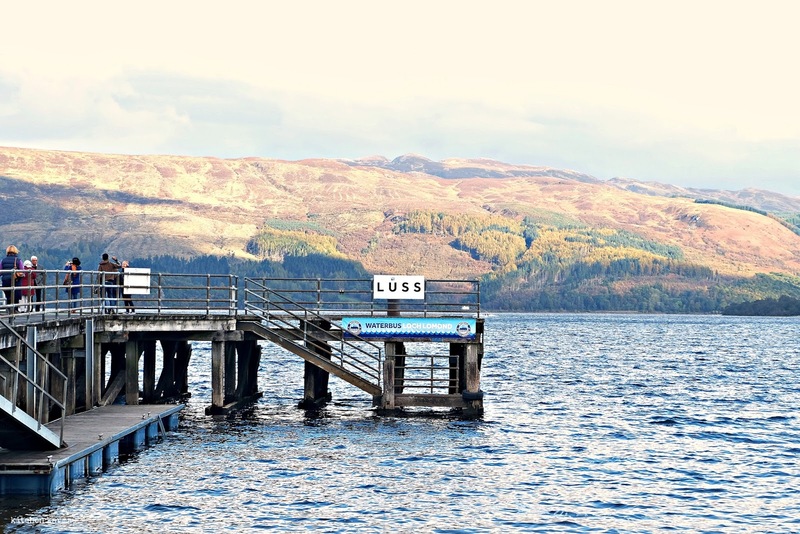 We had lunch at a lovely local seafood place at Luss where we all were super impressed with the salmon and after exploring the quaint gift shops dotted around the place we set off for Fort William on the shore of Loch Linnhe. When you get views like this on the way you need to stop to enjoy the scenery and take some photos. By the time we reached Fort William and figured out how to access our hotel and checked in, it had gone dark and I missed out taking any photos of the Loch Linnhe. My husband was eagerly looking forward to have haggis pakoras ever since we arrived in Scotland, finally we had them for dinner at the hotel. Day 4, Monday~ Lovely to start Monday morning not going to work. Ah the joys of being on a holiday! We didn't even mind getting up at 6 a.m. on a cold, cold morning to hit the road. 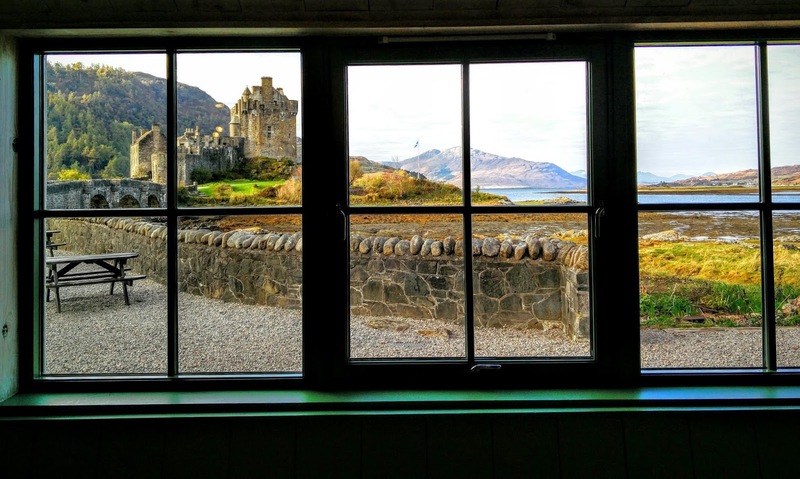 Our first stop of the day was the iconic thirteenth century Eileen Donan Castle which is situated in the western highlands of Scotland on a small tidal island where three lochs meets --Loch Dutch, Loch Long and Loch Alsh. 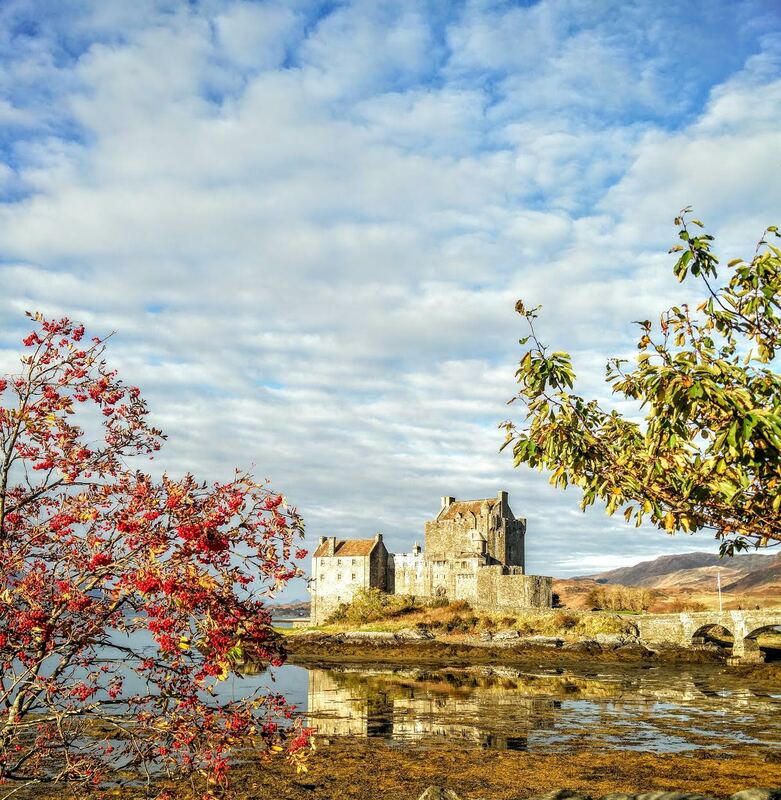 This tiny castle is perhaps the most photographed sight in Scotland. Once we saw the castle we realised why. It is beautiful and the sight has almost everything that Scotland is famous for-- castles, lochs and stunning scenic beauty. The only thing missing was some whiskey. From the castle we set off towards the Isle of Sky, the destination was the town of Portree. The drive was really stunning, we crossed the iconic Skye Bridge, which is called the Gateway to the Isle of Skye and the Outer Hebrides. 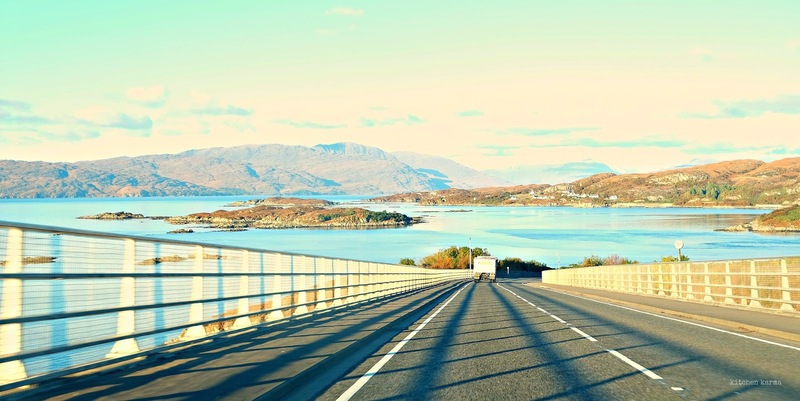 Thanks to a determined struggle put up by the locals of that area, there is currently no toll charged on this crossing, or in fact on any bridges in Scotland. Now isn't this a cool thing? 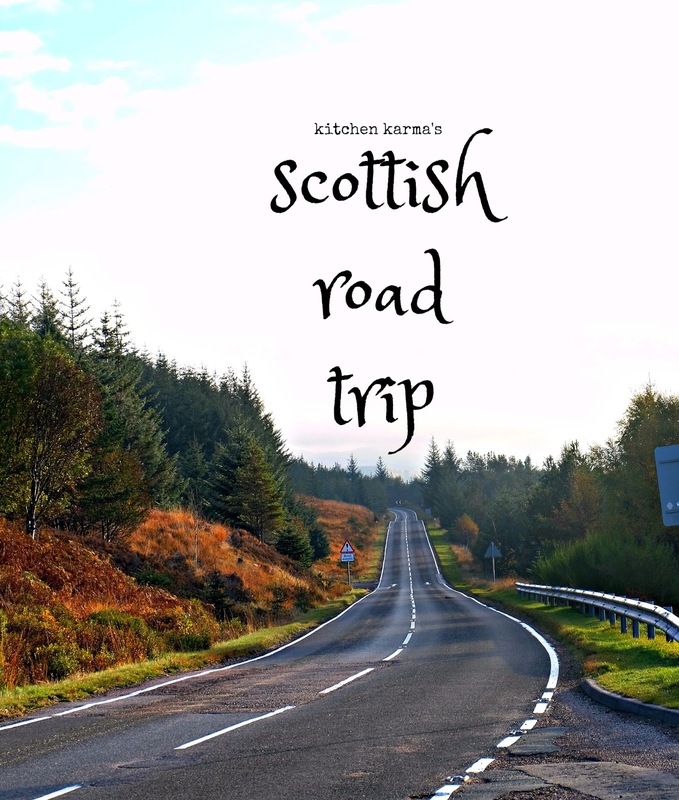 By then we had seen so many gorgeous lochs, and travelled through winding hilly roads, crossed hump back bridges, gone through serene forests, that I was getting tired of stopping for photos. All I wanted to do was sit back quietly and soak in the view. But that's easier said that done if you are going through roads like these and have a camera all ready to be used on your lap. We reached Portree by late afternoon and was ready for lunch. 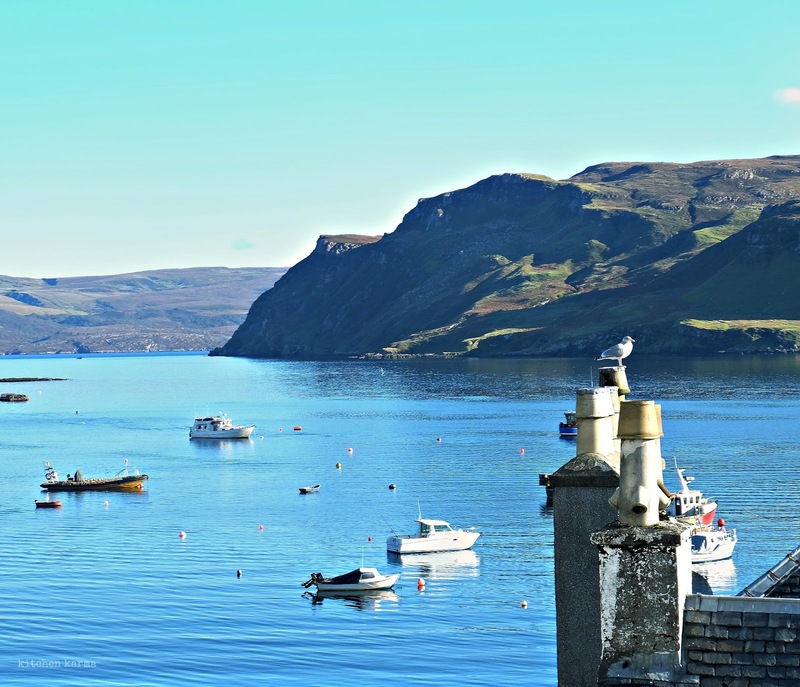 We had fish and chips prepared with locally sourced fish, explored the Portree harbour and the few shops dotted in and around the high street. It's a quaint little town and since October is not the tourist season, pretty empty. It suited us just fine. 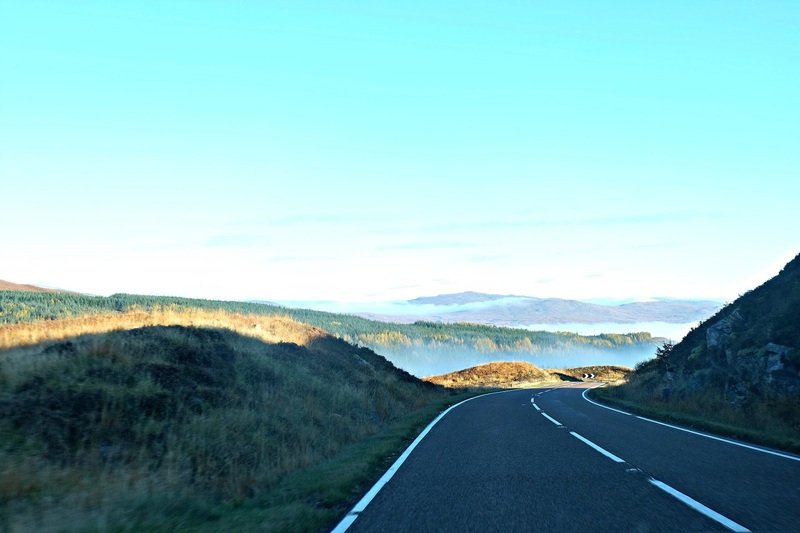 Once we finished exploring Portree, it was time to hit the road again. This time it was a long drive to Inverness. We were doing well time wise, but once we hit Loch Ness, the road became narrow and hilly and we got stuck behind a super slow moving camper van. A long queue formed and the going got really slow. Much to our frustration, because by the time we reached Urquhart Castle it had just closed for the night. 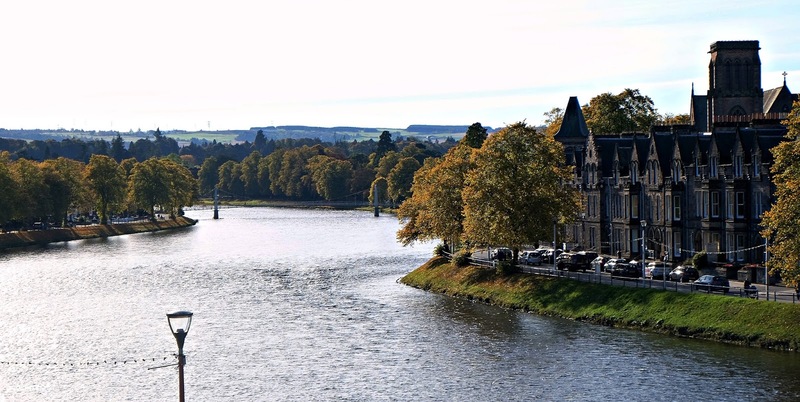 Day 5, Tuesday ~ We decided to take it easy, no long drives, just explore Inverness and the River Ness and let my brother and sister-in-law do the Glenmorange distillery tour while we baby sat our niece. It felt good to spend time out of the car and just relaxing. Day 6, Wednesday ~ Was the day we decided to do the Balmoral Castle. 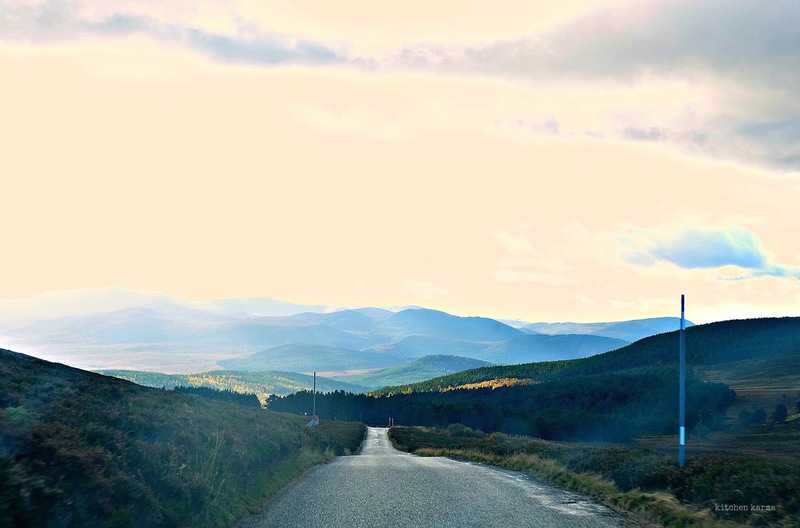 The drive from Inverness to Balmoral was the best we have had in the journey so far. And we had driven through some gorgeous roads. But this was special. Rather it was simply stunning. We did the tour of the Balmoral Castle, the gardens were a riot of autumn colours. From the Queen's summer castle we drove to Edinburgh. Day 7, Thursday~ Long drive from Edinburgh to Sutton, took us eleven hours. To spare my baby niece that long drive (poor thing she was getting tired by then) my brother and sister-in-law stayed the day in Edinburgh and flew in the next morning. On this trip my husband drove approximately 3000 miles and he loved driving every minute of it. It's so good to have a husband who loves to drive! 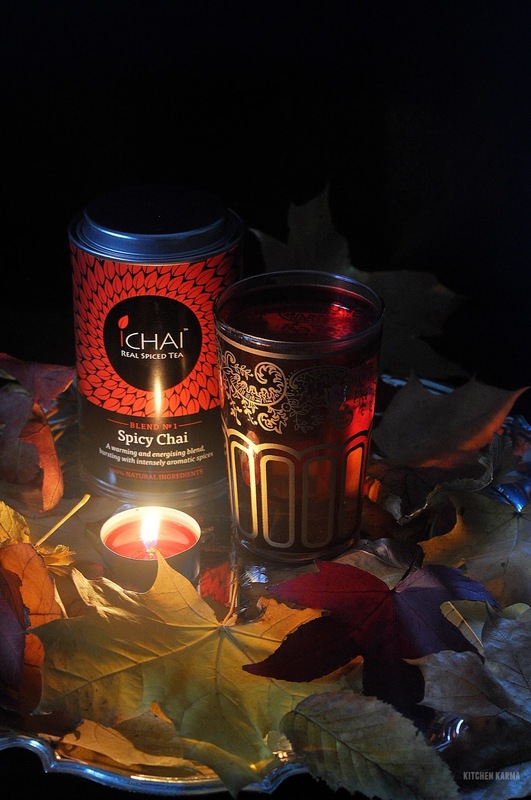 Of course all this traveling needs fortification and my favourite drink this fall is Ichai's Spicy Chai. Now you may know that I am bit of a tea snob, you just can't make me take to any tea. But this tea, with it's rich spicy and slightly fruity flavour (I spy some berries in there) totally impressed me. I have been drinking cups of this to ward off the chill. Perfect autumn drink. 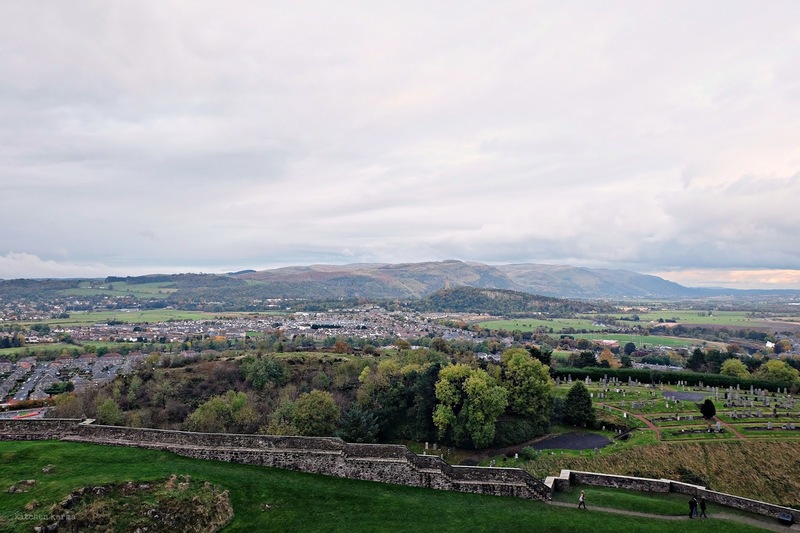 If you enjoyed reading this post, you may also enjoy my other travel posts based on Scotland, this one is about our trip to the Argyll region in the December of 2014 and this post dedicated to the quaint town of Inveraray perched on the western shore of Loch Fyne.